Unfortunately, most of these symptoms, i.e. migraines, earache, and a stiff neck/jaw do not overtly suggest that the clenching and grinding of teeth may be the cause – leaving bruxism one of the most under diagnosed conditions in the UK. The most common cause is stress and anxiety. This accounts for approximately 70% of cases. There are also links with sleep disorders such as sleep apnoea, medications such as anti-psychotic and anti depressant drugs and life style choices such as alcohol, smoking and the use of drugs. If you have any of the symptoms mentioned above let your dentist know. They can help to work out if you have bruxism. This may include looking for any wear and damage to your teeth, checking the muscles in and around your jaw and the function of the jaw joints, which are just in front of your ears. 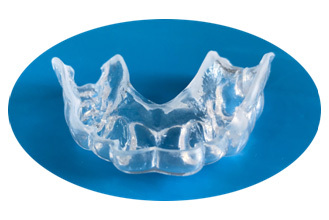 If you are grinding your teeth at night, a biteguard can be made to be worn while you sleep. This is similar to a mouthguard and protects your teeth and jaw muscles from the pressure of grinding and clenching. If your bruxism is caused by stress and anxiety then treatments such as relaxation techniques, yoga or counselling are often recommended. Cutting back on alcohol and giving up smoking and recreational drugs is also advised. If you are suffering from any of the symptoms above and suspect that bruxism may be the cause please book an appointment with your dentist.